YUW 750 XT is a unique and versatile unitized wall system designed to curb a building’s energy appetite and protect against interior moisture. The system is designed to be assembled and glazed in a climate controlled environment for increased quality assurance of critical seals. 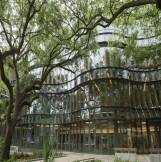 Tulane’s Freeman School of Business is comprised of two buildings in the heart of campus. It has seen explosive growth of students, faculty and an evolving learning environment. Tulane set out to unify two halls into one complex by adding a 45,000 sq. ft. four-story addition and renovating 40,000 sq. ft. of classrooms and lecture halls. 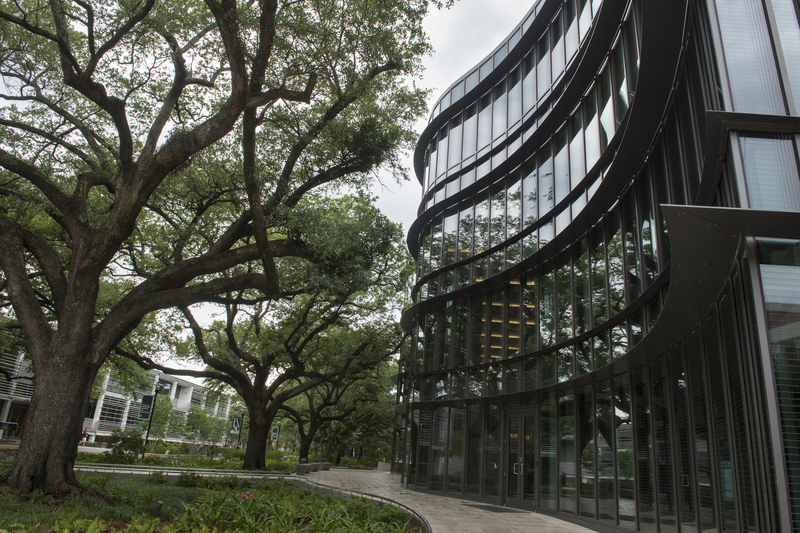 Inspired by Tulane’s mascot, the Wave and several 100+ year old oak trees lining the street, a scalloped curtain wall was designed as the heart of the project. Given the historical significance of the trees and weather-related conditions that are an ongoing threat to New Orleans, it was critical to preserve the trees and provide protection against extreme weather. Additionally, LEED Gold was a core criteria. The YUW 750 XT unitized curtain wall was selected to meet these goals. One of the highest performing, impact-resisting products on the market, YUW 750 XT can achieve a U factor of up to .32 BTU/(h °F ft²). An advanced thermal barrier protects against interior moisture and it interfaces with ThermaShade sunshades for added performance. 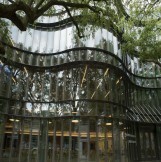 For further protection, 1-5/16” thick insulating glass with Butacite 090 PVB interlayers were incorporated. Because of the unique shape, design challenges were presented. First, while the layout of the scalloped steel worked in CAD, it didn’t work on site. As a result, areas which weren’t a 90-degree angle didn’t match the field layout. These were modified based on the already-implemented design of the structural steel and curbs. Because little product had been fabricated, fortunately adjustments to YUW 750 XT were made with minimal delay. Second, YUW 750 XT required more than a standard mullion; 5 custom mullions, 2 concave mullions and 2 convex mullions were needed to create the shape. Third, to correctly position custom sunshades and fins, each mullion shape required a custom anchor bracket machined specifically for their location, resulting in many permutations of anchor brackets. Lastly, since most mullions weren’t rectangular, horizontal face covers were ever-changing. Likewise, the unit module for locating sunshades and fins was different from the face cover dimension and varied from opening to opening. Rather than face covers being cut squarely, they were miter cut to accommodate the scalloped shape. 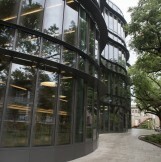 The YUW 750 XT custom curtain wall met each challenge with ease to create the design so representative of Tulane. It was also customized to incorporate a vertical and horizontal frit, a key factor in bird deterrence and of LEED Gold. 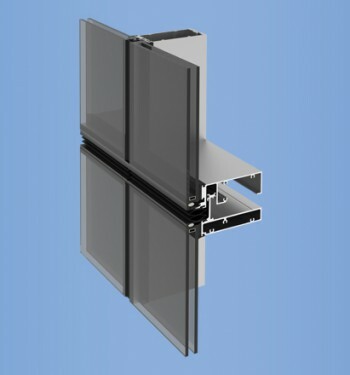 The combination of a unitized, impact resistant curtain wall, developed in factory-controlled conditions to ensure structural integrity and long-term durability, ensures the safety of the building. Additionally, a 3-story atrium fronted by the wall of waving glass, provides an open, transparent environment to enhance collaboration. 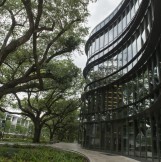 The new complex serves as an ode to the university and gives respect to the 100+ year old trees.